I arrived back in Sweden a few days ago. For the past few weeks I've been reading on Facebook about the snow and freezing temperatures. Being from Gothenburg and having spent the last few winters abroad, I haven't seen proper snow for a while. I was very much looking forward to it. People were not kidding. It was COLD!!! As soon as I disembarked the plane, a cold wind slapped my face red and you know it's cold when your teeth are freezing. Apparently it was -13 degrees (8,6 F). But it was beautiful. The sun was shining and the snow was glistening white. It was like a Christmas card. I had forgotten how much I loved the creaking sound of snow. 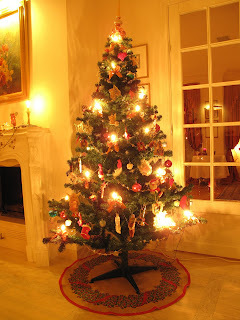 When I arrived home with my parents, we went up to the attic, got all the Christmas decoration out. My dad put up the Christmas tree, my mum tended to the fire place and I sorted through and dusted our Christmas ornaments. We put on some Christmas music and decorated the tree. We drank some Swedish Christmas wine (glögg) and ate some gingerbread cookies. For dinner my mum had prepared a Christmas ham and vört-bread. I was in heaven! Later that night I fell into a deep food- and jet-lag induced coma. This was a perfect start to highly anticipated visit to my dear and beloved Gothenburg. A very beautiful christmas tree!